Fire alarms are a standard regulation in any property that is accommodated. As with all Able Electric services, our qualified electricians can install or repair fire alarms 24 hours a day seven days a week. Our installations of fire alarm systems range from single zone controls to multi addressable systems. 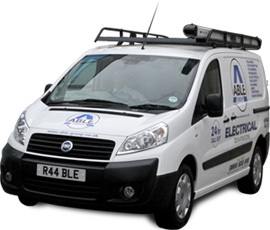 If any faults occur we have trained electricians on hand to deal with any wiring repair that same day. For any help and advice you can contact our trained 24/7 operational staff on our free phone services. There is no call out charge for this service so you only pay for the time that is spent carrying out the work in hand.